Idyll, Romantic Fantasy is the first release from Heyoka Studios using the 1PG game system under license from Deep7, Inc. 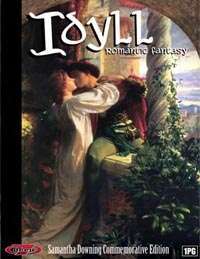 Loosen your blades and bodices in this exciting game that emulates romantic fantasy fiction popularized by authors such as Tamora Pierce, Mercedes Lackey and Tanith Lee. The 1PG system is literally the entire game system contained on a single page of paper! Also included are custom character sheets, magic rules and sample spell list, referee advise, six adventure scenarios and custom genre rules specific to the genre. The 1PG system is ideally suited for those nights when you need a quick filler game or for introducing new or young players to roleplaying. This title was added to our catalog on April 29, 2007.